If you’re lucky enough to be the one throwing a party this holiday season then I’m sure that one of your biggest worries is that one friend you invited who often has a little spill after she’s had a few too many eggnogs. Spills on carpet & upholstery most often stain permanently if they are not dealt with properly and immediately. This is why I’m going to give you some quick carpet cleaning tips for holiday spill cleanup. • The very first thing you should do for cleaning up a spill on carpet, is to as quickly as possible try and get as much of the liquid up as you can. The best way to do this is to blot (soak up) the spill with a clean towel or rag. The most important thing to remember here is not to rub the stain. Doing so will actually make the spill worse and spread it into a bigger mess. Before you go about cleaning the stain it is essential that you remove as much of the liquid from the spill area as possible. • The next thing carpet cleaning tips that you want to follow is to begin to clean up the carpets spill. For obvious reasons, remember not to use bleach. A recommended cleaning solution is a mixture of warm water and standard dish soap or detergent (I like Dawn). 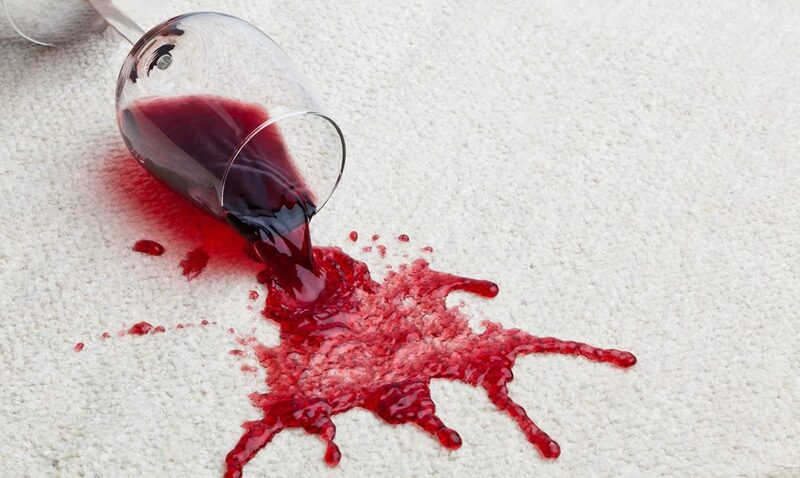 In order to clean the carpet spill you want to use the same technique that you used to remove the excess liquid from the spill area. This means wet your rag with the cleaning solution and blot the localized spill location (don’t scrub) and repeat until the spill is removed. • Once you’ve got the spill removed it is essential that you use the proper neutralizing solution (which depends on the type of liquid spilled) to treat your carpet stain. Doing so will insure that any residue from the cleaning solution won’t cause resoiling. A few of the most common holiday carpet spill offenders share the same neutralizing agents. White wine, tea, coffee and beer all respond well to white vinegar. I recommend that you mix white vinegar and water together at a ratio of one part white vinegar to two parts water. If the stain was a soda pop or something clear, you’ll want to take about half cup warm water and add 2 teaspoons of ammonia; be careful applying this mixture with too much ammonia can further damage your carpet. If It’s RED – Use Your Head! If your stain happens to be a red wine your entire cleaning procedure should be a bit different. Blot up the initial liquid just as you would anything else but instead of using the dish soap detergent solution, keep the area of the spill slightly damp and call us here at Professional Carpet Systems as soon as possible. With red wine time is essential. Be sure to treat your stain as quickly as possible or you may never get it out. Hopefully you can use these methods to help deal with your holiday carpet spill cleanups and you’ll make it thru the Holidays happy and jolly.